When you pay taxes, do you do so voluntarily? Or do you do so because you are forced to do so? If you don’t pay your taxes, what will happen? Will you be fined further? Harassed by the IRS or other government entities? Jailed? 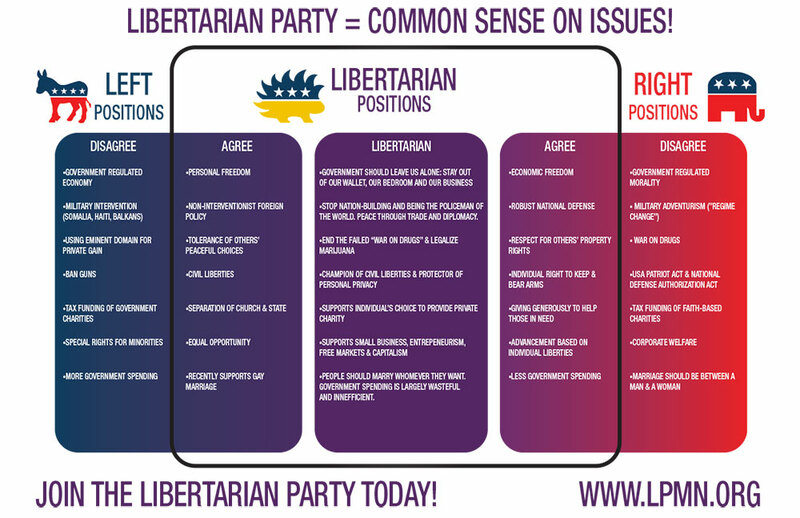 The Libertarian Party is fundamentally opposed to the use of force to coerce people into doing anything. We think it is inherently wrong and should have no role in a civilized society. Thus we think that government forcing people to pay taxes is inherently wrong. Libertarians advocate for voluntary exchange, where people are free to make their own choices about what to do with their lives, their time, their bodies, their livelihood, and their dollars. If Americans want to give money to the government for one reason or another, they should be free to do so. If Americans prefer to spend their money on other things, then they should be free to do that also. Libertarians believe that all people have the right to freely offer goods and services on the market and that free-market approaches are the most effective at improving people’s lives. Our current economy is more crony capitalist than it is free, and that is responsible for the majority of problems that some try to blame on capitalism. The free market, when it is allowed to do so, provides tremendous opportunity for people of all backgrounds, interests, and abilities. Crony capitalism, however, benefits the wealthy, powerful, and special interests who know how to influence policy makers. Libertarians default towards freedom in all things, including economics. When people are allowed to run their businesses the way they see fit, without inappropriate government interference and meddling, those businesses are able to innovate and create tremendous value for consumers and more jobs for employees. Libertarians believe that the only proper role of government in the economic realm is to protect property rights, adjudicate disputes, and provide a legal framework in which voluntary trade is protected. Unfortunately, the vast majority of regulations on the books do not do that. These regulations are heavy burdens on businesses and people who are just trying to make a living, and often prevent new businesses from starting, prevent existing businesses from hiring new employees, and even force businesses to close. This violates the rights of people to engage in peaceful and honest trade. Additionally, it actively hurts people by stifling human energy, innovation, and well-being. Libertarians believe that taxes have the same effect as over-reaching regulations and are a confiscation of the property of other people. Libertarians advocate reducing and eliminating taxes whenever possible to free people and businesses to do what they do best, so that everyone can have a chance to succeed. In summary, Libertarians advocate removing unproductive regulation, reducing and eliminating taxes, and getting government out of the way of innovation and job creation.